Back to school can be a stressful time for parents. Whether it's because the family is having to adjust to a new schedule or it's the first time your child is attending school, the transition can be tough. During all this craziness, finding time to cook seems impossible but when you have cute back to school treats motivating you, somehow you're able to fit it in. These simple sweets are a fun way to add pizzazz to school lunch. Pretzel crayons are a creative treat to pack in your child's school lunch. Pretzel sticks are dipped into colored candy melts (the same color on both ends) and rolled in a homemade crayon label. When your child opens his or her lunch pail, all the kids are going to be uber jealous of this homemade treat. This is also a great gift to give to teachers. If you're teaching your kids the alphabet, doing it with homemade ABC muffins is a guaranteed way to get them interested in letters. An apple muffin recipe has been adapted so that freely formed muffins can be baked on a cookie sheet instead of a muffin tin. Before going in the oven, they are sprinkled with cinnamon and sugar. You can also make this recipe with pears and peaches. 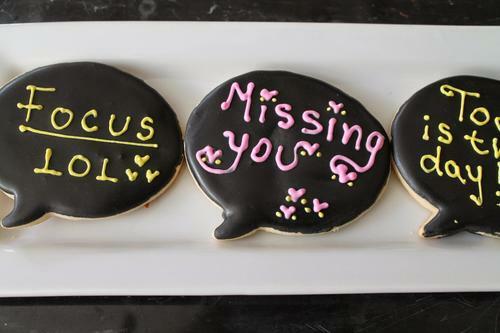 These thought bubble cookies allow you to leave surprise personal messages for your kiddos in their lunch box. Whether it's words of encouragement or something as simple as "I love you," your child will appreciate the extra effort you put into creating this extra special treat. The old saying "an apple a day keeps the doctor away" didn't specify that it couldn't be in the form of a cupcake. These adorable apple cupcakes are truly a special treat to pack in your child's lunch box. Shredded apples make up the bulk of these cupcakes along with the usual cupcake ingredients. 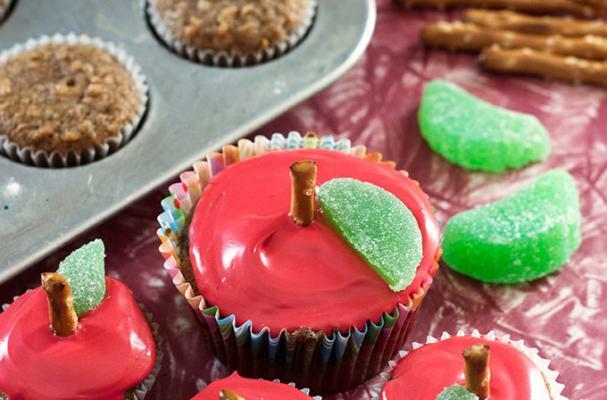 They are topped with red cream cheese frosting, a lime jelly candy and a single pretzel stick to give the cupcakes the appearance of an apple.